Thanks to the support and encouragement of fans, followers, friends, and interviewees, BOTH the Speculating Canada website and the radio show Speculating Canada on Trent Radio won Aurora Awards. These awards wouldn’t have been possible if all of you weren’t willing to go on this adventure into speculation with me, creating a space where we can all ask powerful questions, explore the deep ideas that SF literature evokes, and imagine possibilities. Speculating Canada (whether in its web form or over the airwaves) is ultimately a teaching forum. Now, when I say that, I don’t mean that it is sharing facts (as some people assume teaching is), but instead that it recognizes that fans and authors are brilliant people, more than capable of thinking of the deeper ideas and messages in their literature and interrogating those deeper ideas. We as fans and authors know that little secrets – that even though we say our literature is “just a fun read”, it is always so much more because we understand ourselves and our world through stories, and speculative literature always has deeper questions in it. After all, the term Speculative Fiction says it all – it tells us that we are reading a literature of speculation, of questions, and we all know that we learn best by ASKING questions, not by just giving answers to them (because no answer covers everything). So, Speculating Canada is a forum for questions, for pondering, and for learning TOGETHER. I am honoured to be on that journey with each of you. Many of you already know this, but the Speculating Canada website originated from a couple of factors that tied together. The first of this factors was my experience of my own disability. I have always had learning disabilities relating to memory, but a few years ago, an unrelated health disability began to create further memory issues and in order to keep up with my own research, I started to write larger notes for myself about each of the works I was reading. I have always made notes about what I read to remind myself of ideas I have had while reading fiction, but I started to take more detailled and longer notes… and it occurred to me that these were very much like reviews (well, reviews with a bit of analysis). When I realized that I was essentially already writing reviews, I allied this with my consistent desire to make teaching accessible to those outside of the university classroom. I am able to discuss issues and ideas in literature with the university students in my classroom, but I am also aware that not everyone has the privilege to be in university AND many people want to carry on the types of questions they explored in university long after they graduate. So, Speculating Canada became a place for me to put ideas out there for all of you brilliant people who read this website to participate in. When friends of mine and fans of the Speculating Canada website started asking me about different formats for my editorials and interviews, I finally took up Alissa Paxton’s suggestion that I turn Sepculating Canada into a radio show. Alissa was already a long-time participant in Trent Radio and she convinced me to create the show over time by gradulally interviewing me on the air for different special topics and through that she convinced me that the radio wasn’t too scary. The people who run and have shows on Trent Radio 92.7 FM made the experience of having a radio show one that was consistently filled with excitement. I went with a “coffee shop chat” style for the radio show because I was tired of hearing interviews of authors that were highly edited to the point that their ideas were reduced to robotic sound clips. I wanted my show to be one where the audience feels like they are right at the table with myself and the authors I interviewed – to let the listener feel like they are part of the conversation, because, dear listeners, you are always in the studio with us conceptionally even if you are listening from a distance. I don’t edit out the “ums”, “wait whats” and “likes” because they allow us to experience the author as an actual human being and allows us to realise that autors say brilliant things even when they are having to think on the fly. The fabulous people I have interviewed have been wonderful at going along with the “coffee shop chat” style of the show, letting themselves have a natural conversation… and, of course, for letting their inner geeks loose and allowing us to be fans together. I want to thank the interviewees for letting me push the interview boundaries by asking them deep questions and inviting them to interrogate and explore the deep questions of their work. Speculating Canada has always been an opportunity to share my love of Canadian speculative fiction with others but it became so much more than that. It became another forum to teach outside of academia (and when I say “teach” I mean share questions and ideas with other brilliant people and let them know that they are able to interrogate what they are reading). It was a forum for reviews (my little love letters to the authors I adore). It provided me with a space to interview authors and share their brilliance with others – the incredible insights that go into speculative fiction writing. But the most important thing that Speculating Canada became was a community. It allowed me to meet others who are passionate about their SF, who love it and love to think about it. I met some of my most treasured friends through Speculating Canada and I want to thank everyone who has supported it. We are lucky to be part of such an amazing fan community and I feel fortunate that I have found a community to connect with and share with. Thank you to all of you who supported speculating Canada in diverse ways. For those unaware of the Prix Aurora Awards, these awards are Canada’s equivalent of the Hugo Awards. 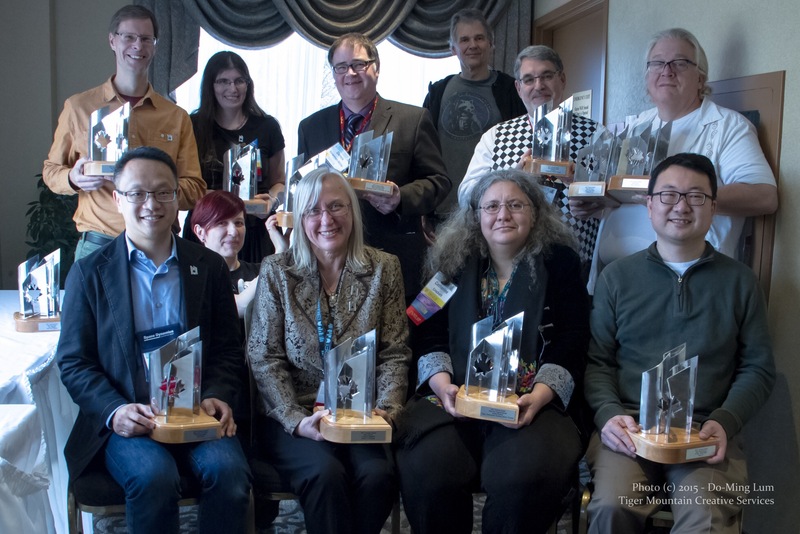 They honour all of the top voted creators of Canadian Speculative Fiction. 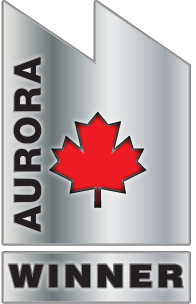 To find out more about the Aurora Awards, visit their website at http://www.prixaurorawards.ca . Here is the full list of 2015 Prix Aurora Award winners. I am so pleased to be part of such a distinguished list of brilliant people.